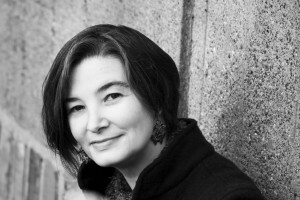 Kelly Jones is the author of Are You Ready to Hatch an Unusual Chicken?, a new novel for kids. 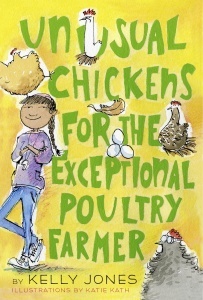 It's a sequel to Unusual Chickens for the Exceptional Poultry Farmer. 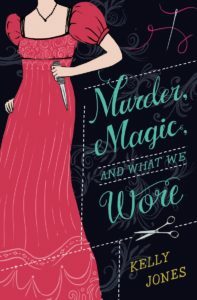 She has also written the young adult novel Murder, Magic, and What We Wore. She lives near Seattle. Q: At what point did you know you'd be writing a sequel to Unusual Chickens for the Exceptional Poultry Farmer? 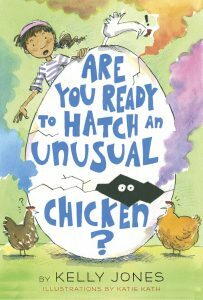 A: I've visited lots of schools since Unusual Chickens for the Exceptional Poultry Farmer was published, and every time, kids want to know what happens next. They helped me keep wondering that too. Then, in spring of 2016, I had a conversation with my editor, who asked if I'd thought about writing a sequel. I admitted that I'd had a lot of ideas about it... My agent and I submitted a synopsis for a sequel along with my next middle grade novel proposal, and Knopf Books for Young Readers decided to buy both books, as announced in September 2017. Q: How do you think your character Sophie has changed from one book to the next? A: In Are You Ready to Hatch an Unusual Chicken? Sophie isn't as lonely -- she's making friends, and getting to know her community. But she's also realizing how much she doesn't know yet, and how much work taking care of chickens can be. I think the first book was about learning to manage on her own, and the second is about learning to let people help. A: That it's not a bad thing to ask people if they can help you out sometimes, and that it doesn't mean you don't know how to do things, or couldn't learn. Asking for help means competent people can get more things done, not less! A: Too many to count, of course, but here are a few of the middle grade writers whose work I love! And I have books by Henry Lien and Sundee Frazier in my pile to read next -- I can't wait! A: My next middle grade novel, tentatively called Sauerkraut. It's about a boy who wants to be known in his community as a maker; he has a plan to build a computer from scratch, and enter it into the county fair. Only, while he's cleaning up his uncle's basement to raise enough cash for his project, he meets the ghost of his great-great-grandmother...who really needs his help making sauerkraut. A: If you'd like to keep up with what I'm working on (and reading! ), you can follow me on Twitter and Instagram at @curiosityjones, and sign up for my email updates on my website. You can also order signed copies of all of my books via a link on my site, through my local independent bookstore. --Interview with Deborah Kalb. Here's a previous Q&A with Kelly Jones.